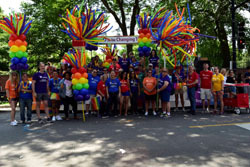 The activity was led by Together as One (TAO), Astellas’ employee resource group (ERG) for members of the lesbian, gay, bisexual, transgender and queer/questioning community, together with their allies. The group’s purpose is to foster an inclusive and supportive work environment that helps Astellas’ LGBTQ employees bring their whole selves to work each day, and furthers the company’s longstanding commitment to support LGBTQ workplace equality. Employees from the Americas and the Europe, Middle East and Africa regions are taking this spirit to Great Britain. Anderson and Linda Friedman, executive vice president, general counsel and executive sponsor of TAO, will join Astellas colleagues to march in the London Pride Parade on July 7. Donations and volunteerism. Thanks to Astellas employees, every bed in El Rescate, a Chicago-based transitional living program for LGBTQ youth, now has much-needed new sheets and pillows. TAO organized a donation drive for these supplies, and many Astellas employees have used their company-provided volunteer days to paint and restore the shelter. Additionally, TAO Co-chair Tim McElderry received the prestigious Ivan Martinez award for his volunteerism at El Rescate – an award that comes with an additional monetary donation for the shelter. The Legacy Wall. Astellas sponsored this traveling interactive exhibit featuring more than 100 biographies of notable LGBTQ people who have had a positive impact on society. The exhibit was created and installed in the Americas headquarters lobby by The Legacy Project. LGBTQ History Lunch and Learn. Victor Salvo, founder and director of The Legacy Project engaged a full house of employees with the stories of the pioneers on The Legacy Wall. Salvo told about the hidden LGBTQ figures behind some of history’s great successes. Astellas Ally Network. TAO helped grow the number of employee allies to more than 500 during Ally Week in May and Pride Month in June. Now in its second year, the Ally network has been expanded to include the Ally Spectrum – four levels of education and engagement that allies can travel until they ultimately reach “Super Ally” status. “Ally 101” Lunch and Learn by Out & Equal Workplace Advocates. Allies learned about the business case for LGBTQ inclusion and strategies to be even more supportive allies through an engaging presentation from Out & Equal Workplace Advocates.